Barranco Ruiz never to be missed. 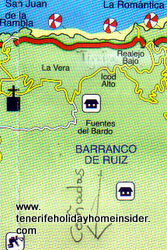 The Barranco Ruiz depicted by the Ruiz Tigaiga aerial map on your right gives you a good idea of its location. It is not just a gorge of Los Realejos. It is a key Tenerife region for scientists of geography, biology, micro biology, ornithology, botany, natural chemistry as well as volcanology. It is one of the steepest and most spectacular ravines of the Canary Islands and may date back as much as 3 Million years. This wide gorge which descends from the Tenerife highlands has a surface of 95,6 hectares and was formed a very long time ago. It has a length of about 2,1km long and is just over half a km wide . It separates the municipalities of Los Realejos and San Juan de la Rambla. 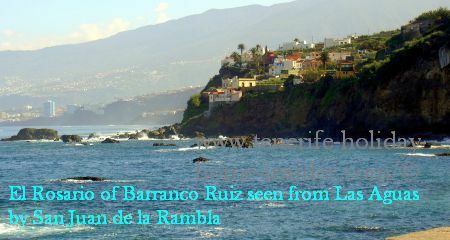 Where the name of the Barranco comes from. 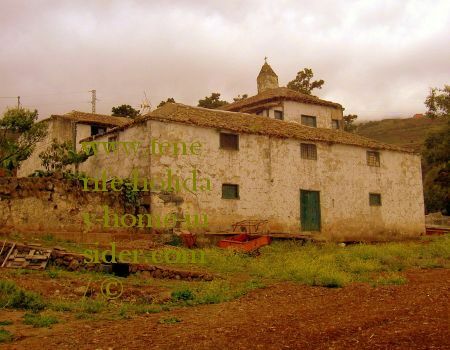 It dates back to Francisco de Ruiz who obtained extensive property in 1520 in the said gorge from Don Maria de Abarca who had received it from the conqueror of Tenerife. Why is the Barranco Ruiz a unique wonder of nature? 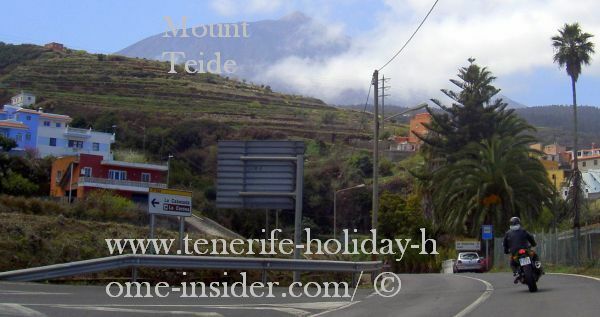 Hugged by Teide National Park above its protected space ending at 1300m a.s. 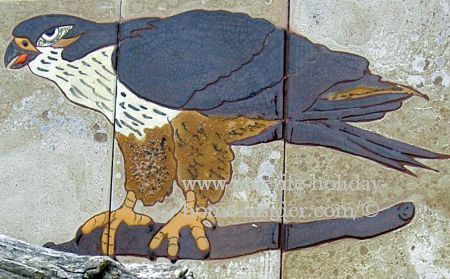 In short, every Tenerife bird is also found in the gorge of Ruiz. 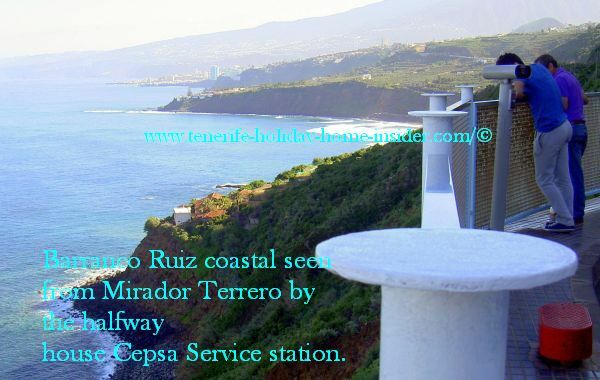 Coastal Ruiz seen from the Mirador del Terrero at Cepsa station. Ruiz Playa at the end of the hiking path Rambla del Rosario. 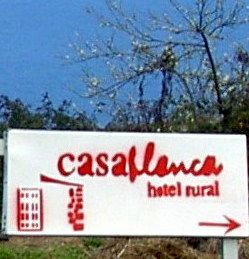 Indicators to Hotel rural Casa Blanca opposite Haciend La Pared. 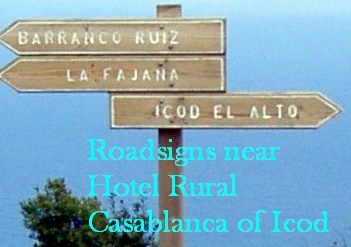 Road signs by TF 342 to Icod el Alto, La Fajana and the Ruiz hiking path. 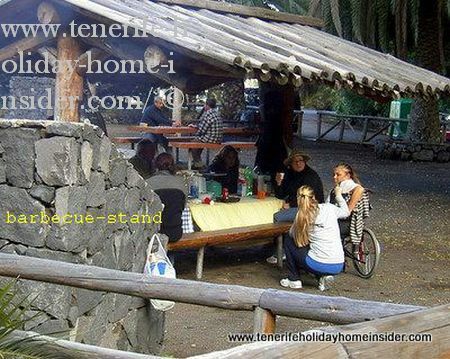 Tenerife picnic barbecue park Campechesde Ruiz. 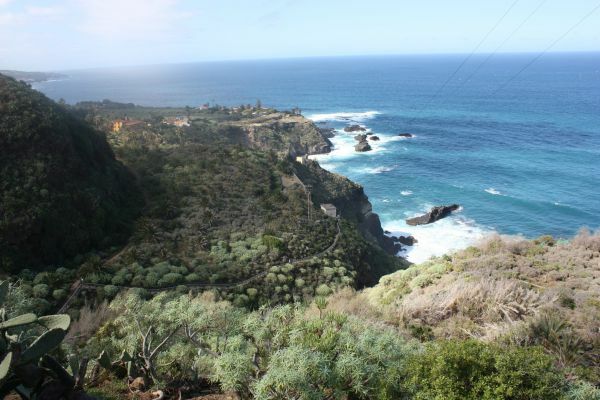 In fact the Barranco and the cliff i.e. Massif of Tigaiga belong together. 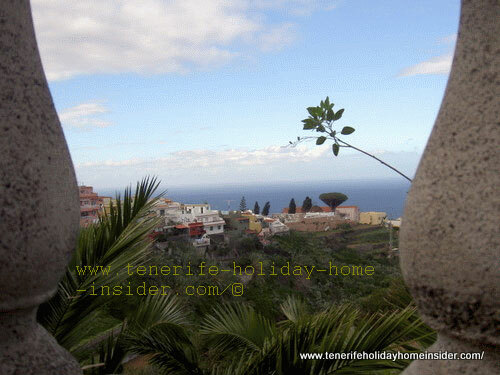 The latter forms the boundery of the Orotava Valley and Tenerife North. Ruiz are still to be explored for biological, geographical, geological, volcanological and chemical clues. 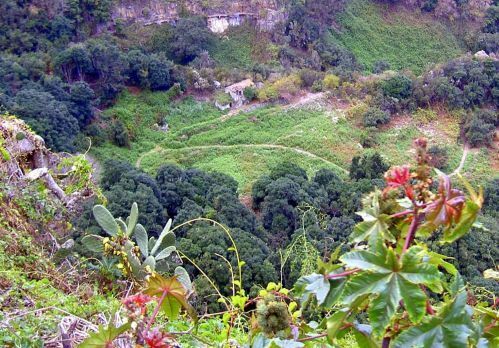 The Barranco Ruiz is one of few Tenerife gorges which has not been tempered with, unless by a little tunnel or a harmless bridge like the one by 'Madre Juana'. 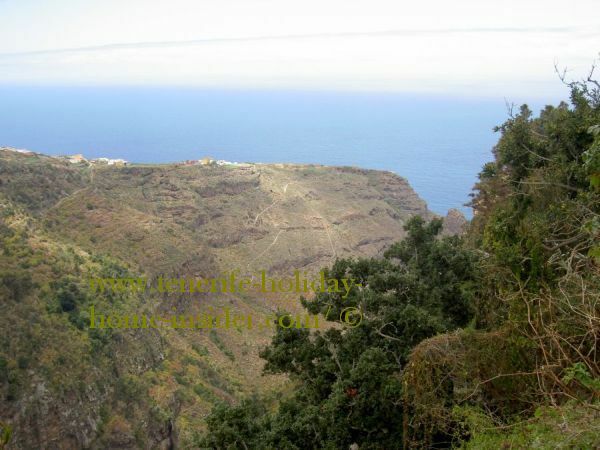 This deep mountain valley is one of Tenerife's deepest and most spectacular gorges. It may be as old as three million years. That's when three separate isles were joined to become one. The ravine of Ruiz measures 510 hectares together with the Tigaiga massif. 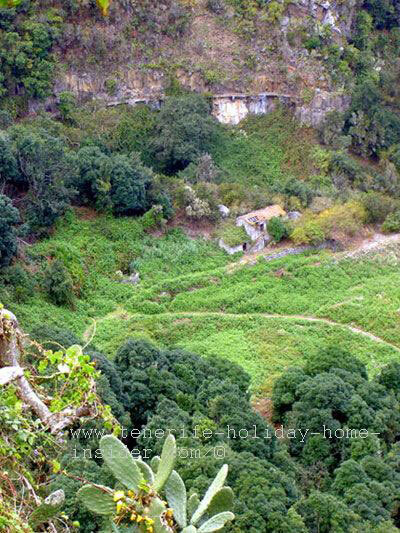 The location of the half ruin farm house offers one of most spectacular views of a very lush and green Barranco Ruiz as well as some arid spaces. Drive on the road TF5 from Puerto de la Cruz towards Icod de los Vinos. Leave all Los Realejos turn offs by your wayside. Take care, as the TF5 stops being a typical multi-lane freeway at the height of lower Los Realejos, where it shouldn't be called TF5 any more and will always be an environmentally protected coastal road with only 2 lanes in each direction. 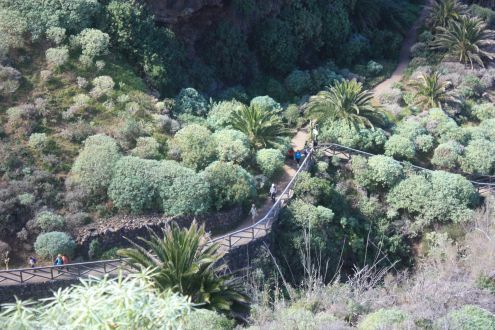 Encounter the Barranco of Ruiz Pick-Nick Grounds at about 15 km from Puerto de la Cruz by km 44 just before San Juan de la Rambla on your left. Turning off to the right allows for a u-turn and to cross the freeway to get into the Ruiz pick-nick grounds. 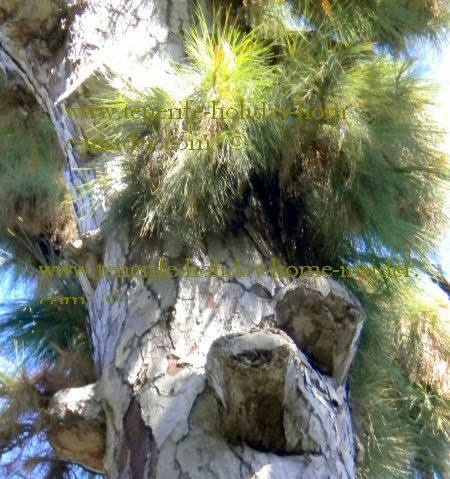 Spot the triangular tree crown of Draco Dracaena San Francisco on the ridge. Indeed, a landmark for Realejo Bajo in the photo below... 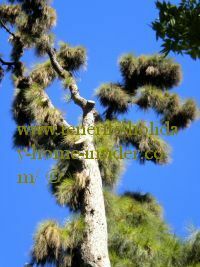 This endemic Tenerife flora is one of several dragon trees that are all unique. Barranco Godinez gorge section between Realejo Alto and Realejo Bajo. The ravine of Ruiz compared to Barranco Godinez. Mind the wide and deep gorge which runs almost parallel to the Barranco of Ruiz. That gorge is called Barranco Godinez. 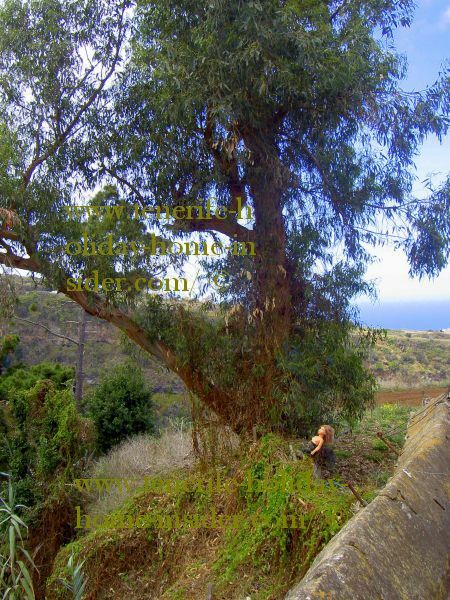 The historical archives of Los Realejos mention this name related to the conqueror of Tenerife the Adelantado De Lugo. They say he reserved all land to the east of Barranco Godinez as high up as Icod El Alto to himself. 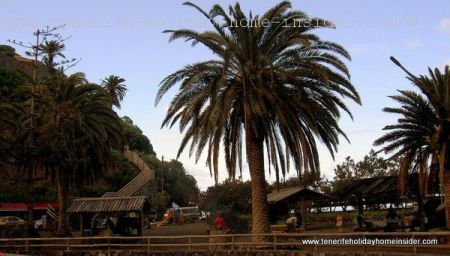 It was the most fertile and most blessed with water which had also been the prime property of the former king of the Guanches the Mencey of Taoro and Orotava. The photo was taken from Realejos Alto which is separated by the Godinez creek from Realejos Bajo. 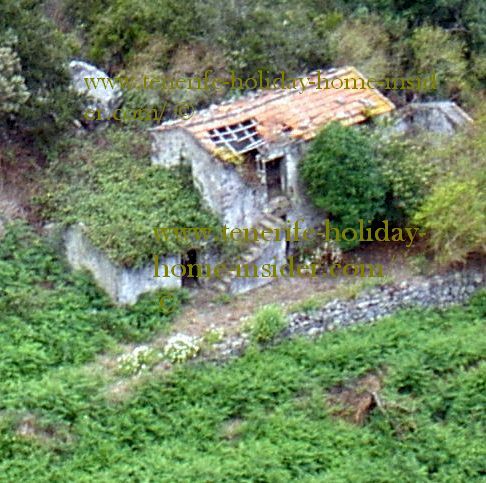 The image depicts very lush vegetation despite two years without rain. However some of the vegetable terraces deep down in the gorge were bare at the time in 2012. Also, the Godinez river bed is more integrated into human settlements contrary to that of the more virgin crest of Ruiz. Some of the Godinez and Ruiz caves once served as housing for Guanches but are now used for agriculture. However, vegetables, and above all potatoes and wheat fields are more prominent at Barranco Ruiz on its Eastern side by Icod el Alto. Even vineyards are successful there. A Tenerife native will do like his ancestors. He will count all ravines near the ocean as part of the land of Ruiz. This concerns the entire region from San Juan de la Rambla up to Barranco de Gordejuela alias Barranco de Palo Blanco. 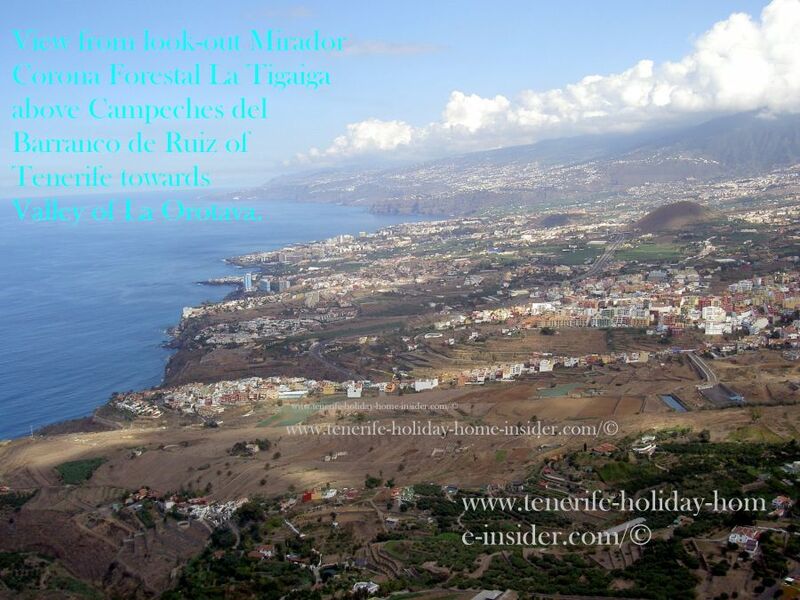 Barranco de San Vincente and de la Calera as well as Ruiz. The Barranco Ruiz region includes Barranco de la Calera. 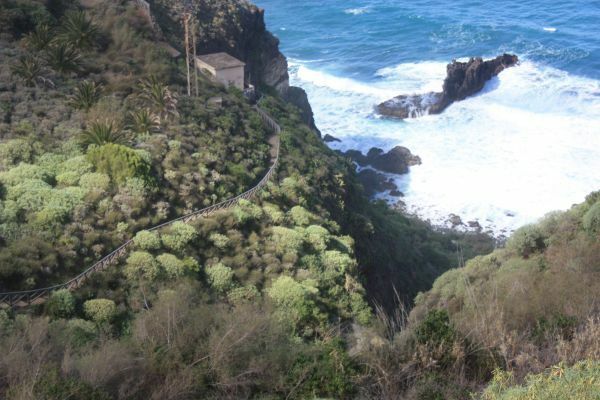 Depicted is its section by the ocean the Barranco de San Vincente with its bridge a part of most spectacular coastal walking in Tenerife. River de Ruiz temporarily dried out by its Atlantic mouth. Related links to the region of Ruiz gorges. 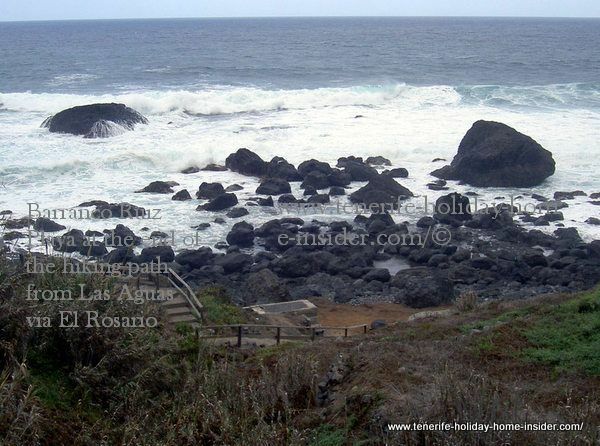 Return from Barranco Ruiz to Los Realejos the region, history, holidays, festivals, sports, its Guanches, culture, beaches, weather, Spanish traditions, La Longuera, Tozcal, La Gorvorana, Viera y Clavijo, hotels, apartment accommodation and much more.